A convoluted combination of biological, physical, and chemical exchanges gives lakes significant sway over climate. Their influence on local temperatures and carbon cycling can translate to climatic variations on local, regional, and even global scales. 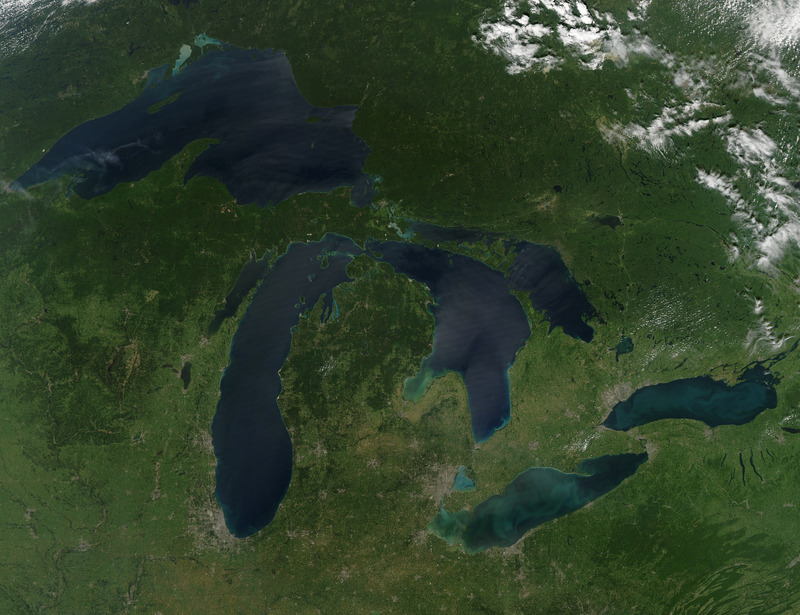 The Great Lakes contain roughly 20% of the Earth’s surface fresh water, and variables like albedo, heat capacity, surface roughness, evaporation, and greenhouse gas exchange exert a measurable influence on the surrounding environment. The movement, or flux, of carbon and water through lake systems has been harder to track, however. The lack of observational data on the open water has so far prevented scientists from examining carbon and water fluxes over long time scales ranging from months to years. However, a new study tackles this problem, using direction measurements of latent heat and carbon dioxide to identify exchanges between the lake surface and the atmosphere. Between October 2011 and September 2013, Shao et al. collected data from the Western Basin of Lake Erie using the eddy covariance technique, which calculates atmospheric fluxes by measuring the turbulent flow of gases. Their instruments were mounted to a buoy roughly 12 kilometers from shore, and a radio system transmitted data every 5 minutes for near-real-time observations. The team also collected water samples up to 1 meter deep to analyze water quality, temperature, pH, and chlorophyll levels. They towed nets to measure the population of the cyanobacterium Microcystis aeruginosa, responsible for noxious algal blooms like the one that contaminated the drinking water of 500,000 Toledo residents in 2014. The team found that carbon flux was closely linked to chlorophyll levels on the monthly scale, with western Lake Erie acting as a carbon sink during summer months. However, on average, the lake was a net carbon source over the 2-year study period. The total amount of carbon released from the lake was equivalent to one quarter of the carbon absorbed by the surrounding forests. Citation: Strelich, L. (2015), Great Lakes hold sway over water and carbon cycling, Eos, 96, doi:10.1029/2015EO037667. Published on 21 October 2015.